Tens of thousands of Palestinians are set to march towards Israel’s borders on the March 30, remembered as the Land Day, in commemoration of the uprising on this date in 1976, which left 6 protesters dead and around a hundred injured. The uprising was triggered in response to the Israeli finance ministry’s decision to confiscate 21,000 dunams (over 5,000 acres) of land owned by Palestinians who had continued to stay in the Galilee region of Northern Israel after the country was carved out from Palestine in 1948. The purpose of this confiscation of land, according to the Agriculture Ministry’s open declaration, was to alter the demographics of the region in order to create a Jewish majority. The call for the march on 30th of this month has come as a unified voice from groups subscribing to diverse political ideologies: from left-leaning parties such as the Popular Front for the Liberation of Palestine (PFLP) and the Palestinian People’s Party to the followers of a former leader of nationalist Fatah to Islamic parties such as Hamas and the Palestinian Islamic Jihad (PIJ). 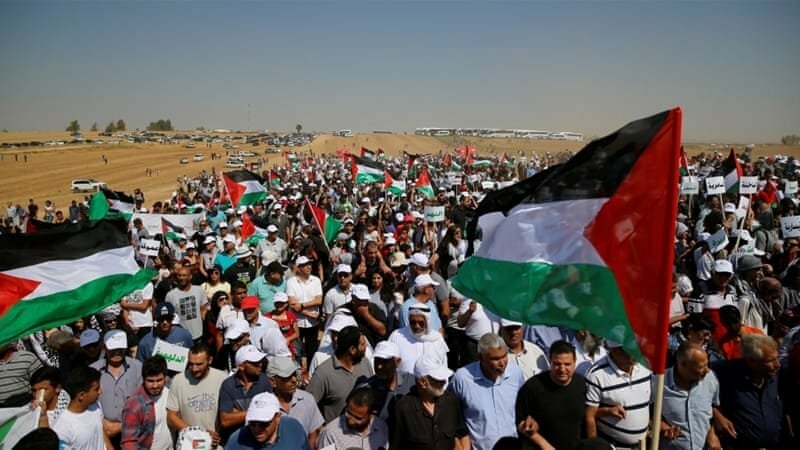 The march is expected to begin simultaneously from the Gaza Strip and the West Bank, in coordination with Palestinians abroad and with Israeli Arabs. Efforts are also being made to also mobilize Palestinian refugees in Lebanon, Syria and Jordan to march to the Israeli border. With the help of local social organizations, tents will be pitched at pre-determined locations along the 40-kilometer long border between Gaza and Israel, 500-1000 meters from the security fence, where thousands of Palestinian families will be lodging. Depending on the situation on the ground, the organizers of "The Great Return March" will decide whether to continue sit-down strike or to give a call to approach the fence, Ahmed Abu Ratima, one of the organizers has said. Once the call is given thousands of families staying in the tents will march to the fence, bare-chested and unarmed. The protests, starting on March 30 will go on for a period of 6 weeks until May 15 - a crucial date for both Israel and Palestine, with the former celebrating its Independence day and the latter mourning the Nakba day, literally translating as the day of cataclysm. It was after this date in 1948 that between 750,000 to 900,000 Palestinians were evicted or had to flee from their land, when independent Israel was created on it. On the date of May 15 this year, around the same time the U.S embassy in Israel might make the shift to Jerusalem, it is expected that the “Great Return March” will peak, culminating into the “march of millions”, senior Hamas leader, Isma'il Radwan, has said in a press-conference. In order to discourage Israel from using disproportionate force against the protesters, the coordinating committee organizing the march and various human rights organisations in the Gaza strip have been drafting letters containing information about this event to Foreign Ministries of different nations, to U.N agencies, the International Red Cross and to numerous human rights organisation around the world, with the hope that sufficient international pressure might be exerted on Israeli forces to not resort to violence. Though most spokespersons of the campaign continue to stress that the protest will be peaceful, the possibility of the marchers clashing with the Israeli defence forces as they try to cross the border fence and enter Israeli territory cannot be ruled out. Head of the political bureau of Hamas, Isma'il Haniyeh, has hinted at the possibility of violence breaking out by pointing that controlling tens of thousands of aggrieved Palestinians marching to the Israeli border from north, east and south might be an impossible task. While the Hamas - deemed a terrorist organisation by Israel, the U.S and the European Union - has so decided to stay in the background and provide only organisational assistance, the Intelligence and Terrorism Information Center, an Israeli research organisation closely linked to the defense forces, has cautioned that once the clashes break out, Hamas may get drawn into a confrontation with the defense forces. On Sunday night, Israeli soldiers fired once again on Gazans who were taking part in the Great March of Return protests. Israeli Defense Forces (IDF) reportedly conducted airstrikes on at least two Hamas positions in the blockaded Gaza strip on Sunday.